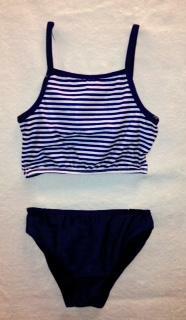 Girl's 2-Piece Swimsuit Navy/White CLEARANCE! Splashwear > girl's 2-piece swimsuit navy/white clearance! Her first 2-Piece...at an incredible price! Girl's 1-Piece Swimsuit Black with Yellow Polka Dots CLEARANCE! Girl's 1-Piece Swimsuit Navy/White CLEARANCE! Girl's 1-Piece Swimsuit Yellow Floral CLEARANCE!